I need to tell you about this Italian custom of each Saturday night in country towns of Puglia, in Italy. It is an excerpt from my book: Come Mia Nonna – A Return To Simplicity. The book contains many cultural notes intended to let the readers discover the region of Puglia in the original way, from me, the writer and local of those parts. Many people would turn their nose up at this dish, because it is made with animal interiors, but read it first, you will know why I am raving. 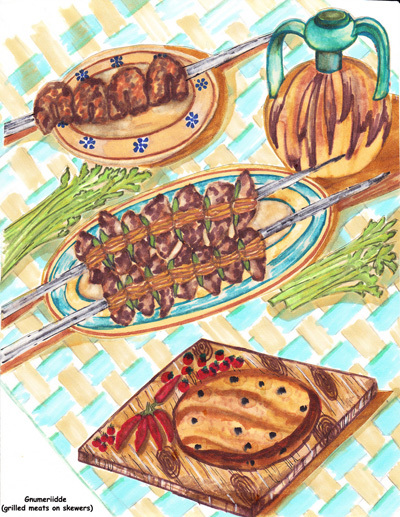 “Gnumeridd” is the title of this specialty, which is the dialect version of the Italian mixed grilled meats on skewers. At the end of the week butchers might have some left over meats and animal interiors. They don’t throw them away, but get creative on Saturday nights. They pull out their grill, place it right outside of their shops and cook the various cuts of meat on skewers: home-made sausages, small pieces of veal or lamb with bones and the “Gnumeridd”. While people are strolling around, enjoying the Italian “Dolce Far Niente” (sweet to do nothing), the butchers grill. The air is filled with the enchanting and phenomenal aroma coming from the butcher’s shop and permeating the entire street. People are attracted by the flavors, their mouth waters, the only sensible thing to do is to stop by the grill and choose the pieces of grilled meat right off the grill which will be served in a cone of yellow butcher paper, wrapped in newspaper sheets. Among those pieces of grilled meats they will find the surprise, which are the “Gnumeridd”. Customers will eat standing up leaning against the wall of the butcher’s store, or sitting along the sidewalk. They will eat using their hands, no forks are allowed and they will enjoy every bite while thinking that perhaps even God must have stopped there for a taste, since these bite size grilled meats are divine! I define the “Gnumeridd” dish a hypnotic type of food, because it is tasty, juicy and aromatic. The reason for the superb taste is the good Puglia olive oil, good clay soil and no hormones in animal nutrition. All of these combined make simple food fit for a King. Once you try the first one, you will want more and more, like cherries. It is a social dish: if you are eating by the butcher’s store every one you know will stop by and with one excuse or another will want to eat with you. This is a specialty of a town in Puglia called Altamura (Tall Walls). Finely chop any spices of your liking, except the laurel leaves and reserve. Coarsely chop the raw liver, hearts and kidneys. Wrap them up into single slices of bacon to obtain rolls of about 4″ long. Tie these rolls with a 100% cotton thread. Stick them tight on a skewer, alternating a laurel leaf between each piece of cubed meat and the Gnumeridd. Baste them with a rosemary sprig in a marinade of olive oil, lemon juice, salt and black pepper and grill them until done inside thoroughly and they are golden brown and crispy on the outside.